This one-ship cruise line is all about history, its cruise itineraries are inspired by the ancient past and it carries a retinue of guest experts on the destinations to which it cruises. Voyages to Antiquity is a cruise line inspired by Lord John Julius Norwich’s The Middle Sea. When it was read by Gerry Herrod, who had previously headed up Ocean Cruise Line, Orient Lines and Discovery Cruises, he was inspired with an idea for a new cruise line. Voyages to Antiquity’s cruise itineraries therefore are based on the voyages recounted in the historical account of the fabled ancient civilizations that flourished in the eastern and central Mediterranean. The cruise line was founded in 2010, with cruise itineraries created in part by Lord John, focusing on ancient civilizations and the journeys of ships of the past, including visits to ports of significant historical and cultural interest. Aegean Odyssey (the former Aegean I) is a ferry-turned-cruise ship. As such, she has a rather haphazard profile, reminiscent of a Lego boat, but she is as modern and comfortable as they come, having been thoroughly refurbished before being put to work in her new role. Piano bar aboard Aegean Odyssey. (Image courtesy Rol Cruise). Aegean Odyssey takes passengers to see the ruins of ancient Egyptian, Greek and Roman civilisations. She spends the summer in the Mediterranean and the winter in Southeast Asia, India and the South Pacific, which provides variety and an expanded geographic region for the line to continue its practice of cultural and historical cruising. The destinations are the prime focus for this cruise line, with lectures aplenty, led by real experts in their field. Shore excursions are included in the cruise fare and are generally regarded to be unrivalled by any other line. As an example, in Palermo, passengers tour the 1,000-year-old mosques that were redesigned as Christian churches by Sicily’s Norman conquerors, and in Libya, they spend two days touring the well-preserved, seldom-viewed Roman ruins of Leptis Magna. Expert lectures about upcoming ports and destinations are a key draw aboard Voyages to Antiquity. While at sea, Aegean Odyssey has a casual sophistication. There is a light décor theme throughout the ship, with public rooms and cabins designed in a way that is unoffensive but perhaps a touch plain. Paintings and artwork in cabins and public areas are in keeping with the antiquities theme. In the lobby and library are intricate ship models of ancient ocean-going vessels and several busts of Roman and Grecian warriors. She accommodates up to 378 passengers, down from an original 570. 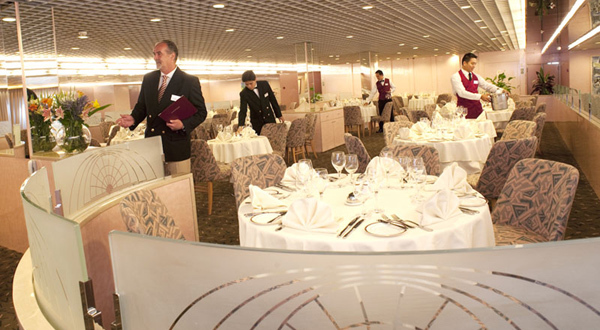 The ship is small by modern standards, with just one dining room, a lido buffet and two bars. Evening entertainment revolves around port lectures and piano performances. The one-ship cruise line targets older British, American, Canadian and Australian passengers who are highly educated and curious about the history and the world. Most are over 50, although there are occasionally younger couples or groups of friends.